I have 4-5 hours between my flight from Amsterdam (Orly airport) and train back to Amsterdam (a one-day trip to Paris). My point is to see the city. I have panic attacks on subways so I avoid them. Is it possible to see the Eiffel Tower and Champs-Élysées for a bit, then head to Gare du Nord? I know the Métro is faster and all, but I want a pleasant trip, not panicky. I will not go up the Eiffel Tower, I will just walk in the park in front of it and take a photograph or two. I just want to experience the city for a while. Orlybus departs every 15 - 20 minutes during the day and takes around 30 minutes to arrive at Denfert-Rochereau. So say an hour to get to the terminus. 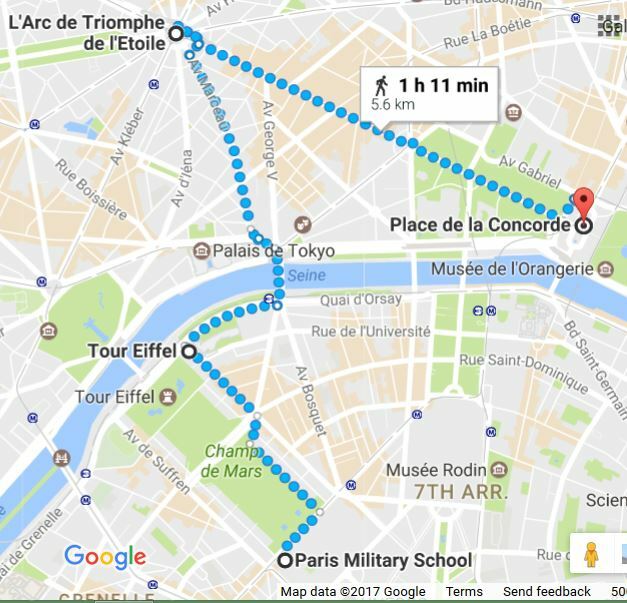 From near there a bus (28) runs to École Militaire, so maybe a short walk and at the Tour Eiffel within 1½ hours. About one hour on foot from there to the Place de la Concorde via Arc de Triomphe and Champs-Élysées. From there there is a bus (42) to Gare du Nord, say about ¾ hour (that is enough time to walk between the two, but you might have had enough time on foot by then). In all round about 3¼ hours even allowing for some long wait between services. So plenty of margin for the vagaries of traffic. Assuming you are already in central Paris, yes, you can navigate the city by bus only. To be clear, I recall riding only one bus in Paris years ago. Like many metro focused cities, the Bus tends to be a longer transit time due to traffic, connections, etc. 4 hours to see a city by Bus is not very long and your biggest challenge might be getting from where the OrlyBus terminates to something worth seeing. Be ready to hire a Cab or Uber if you start to run short of time. I have done it once, you will also be able to walk that long only if you have been used to walk. Otherwise looks reasonably dubious. Not the answer you're looking for? Browse other questions tagged public-transport safety health buses paris or ask your own question. Is the 9th arrondissement of Paris only a tourist neighborhood?